Good Girl Double Diner Cat Bowl is a classic bowl that is great for food and water, or for feeding two cats at the same time. 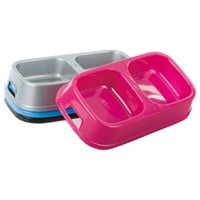 Made out of durable plastic that is easy to clean, these striking bowls will really liven up your cat's feeding time. Please Note: This product is available in various colours which unfortunately cannot be guaranteed.